Discover the distinctive charm and beauty of Laos in this journey through the kingdom formerly known as Lang Xang, the Land of Million Elephants. 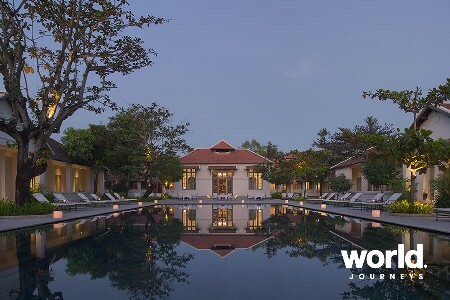 Staying in some of Indochina's most elegant hotels you will have the opportunity to taste the unique atmosphere in Luang Prabang as well as see enigmatic Vientiane. 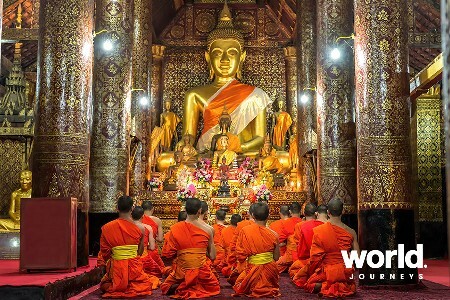 Along the way you will be enchanted and fascinated by this extraordinary Buddhist country noted for her genuinely friendly people and languorous pace of life. 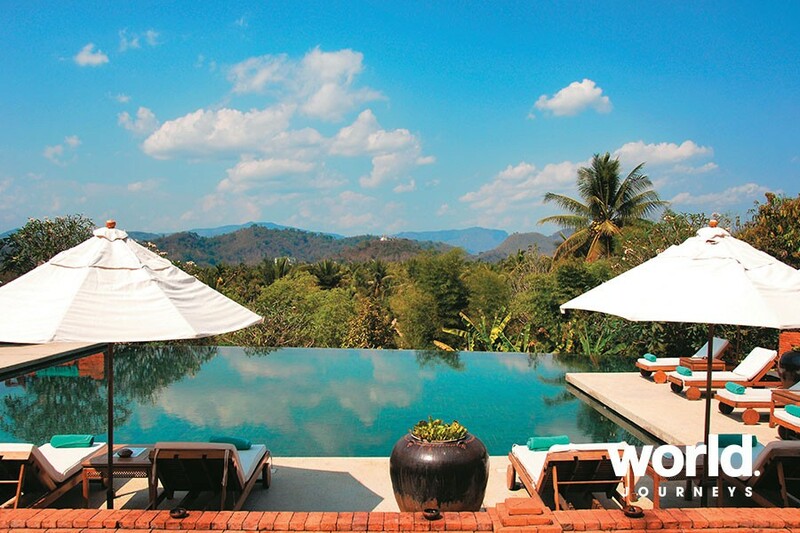 Luang Prabang is one of Asia's most beautiful towns. A unique blend of temples and colonial buildings set between two rivers and a range of limestone mountains, it is one of the last Shangri-la's in the world. Designated a UNESCO World Heritage site, the architectural heritage of the city has been preserved, and no tall buildings mar the townscape. This ancient town is resplendent with well-preserved Buddhist temples, pagodas and tree-lined riverbanks. We will bring you deep into the limestone caverns of the Pak Ou Caves to see the repository of Buddha statues and up Mount Phousi to capture the spectacular panorama of the town. 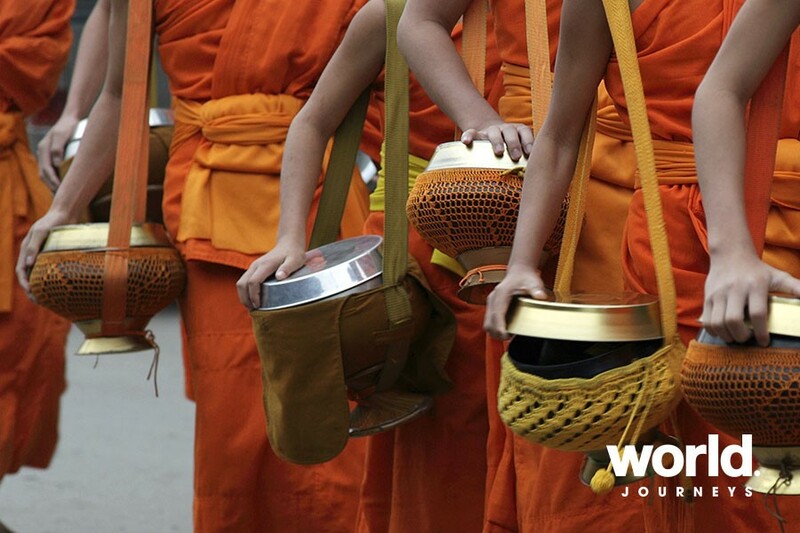 You will have time to observe and partake in the giving of food items to saffron-clad monks as they stroll along the streets during their daily alms collection at dawn as well as pick up an assortment of textiles and handicrafts in the bustling hill tribe night market. 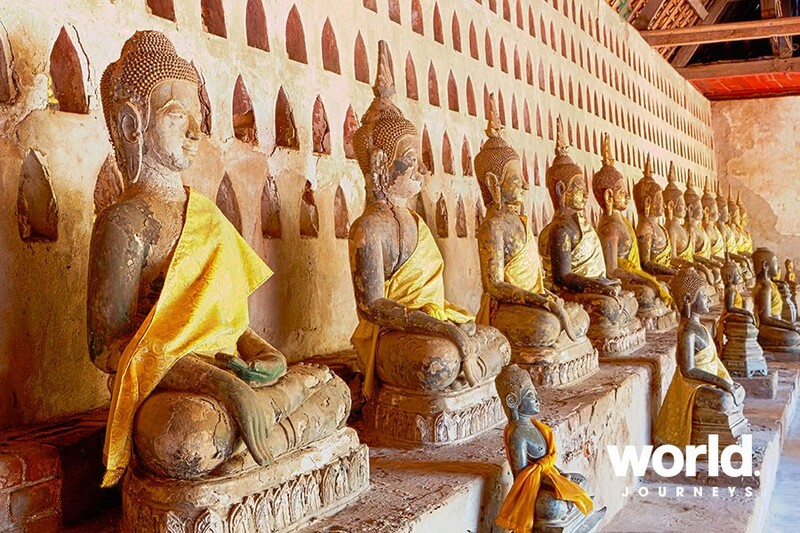 A flight south will take you to Vientiane, the capital city of Laos, located along the Mekong River. Resembling a small town more than a capital, Vientiane still maintains the handsome majesty and grandeur of its colonial yesteryears with its ample French-inspired buildings and wide boulevards. You also have the opportunity to learn the finer aspects of Lao culture heritage through its fine cuisine and traditional crafts besides enjoying an aromatic brew of the local coffee by the riverbanks of stately Mekong River. Day 1: Arrive Luang Prabang Upon arrival you will be met by your English speaking guide and transferred by private car to your hotel. (The regular check-in time for all hotels is 2.00 pm. Early check-in is not included). Start a relaxing hike around the ancient town of Luang Prabang. An orientation tour around this picturesque town will give you the opportunity to chat with monks at a local temple. At sunset, with a short climb to the top of Mount Phousi, located in the centre of town and admire the wonderful view from the top of the town across the Mekong and Nam Khan rivers as well as the surrounding mountains. Baci ceremonies are an integral part of Lao culture. Held to celebrate a special event, marriage, a homecoming, or a departure, it is based on an ancient belief that the human being is a union of 32 organs and the "kwan" (or soul) watches over each of them. The Baci ceremony re-aligns the kwan and the body. A village elder will wrap a white cotton thread around your wrist while chanting an invocation to strengthen the power of the blessing. In Laos, white is the colour of peace, good fortune and warmth. 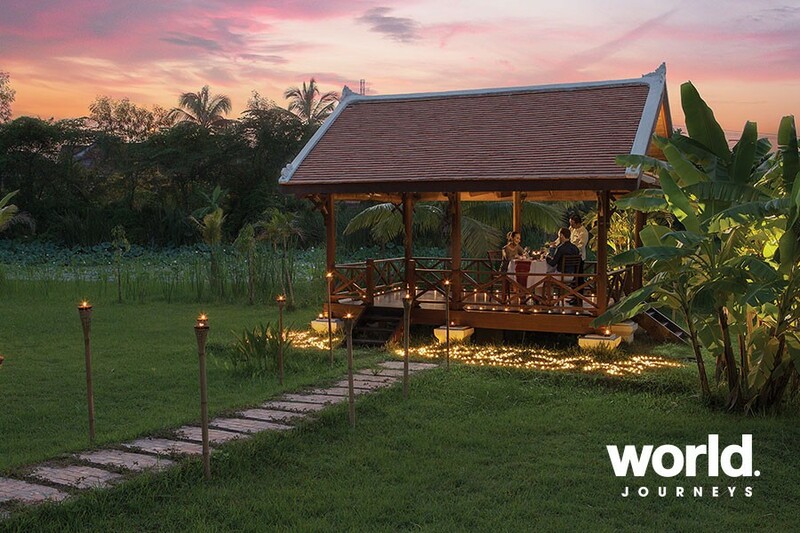 Enjoy the authentic experience in a unique setting and feel refreshed and enlightened by taking part in this ancient practice. (Approx. 1 hour). Day 2: Luang Prabang (B,D) You have the option to wake up before dawn to witness and participate in offering alms to hundreds of saffron-robed monks - an awe-inspiring sight. Please tell your guide a day in advance if you wish to make an offering so he/she can prepare some food for you to hand over to the monks. This early morning ritual dates back generations in Laos. Watch the town come to life in the morning then return to the hotel for breakfast. (If you do not wish to make an offering, please keep an appropriate distance and observe the ritual in silence. Dress appropriately - shoulders, chest and legs should be covered). Start your day with a visit to the Royal Palace, which is now a National Museum and houses the precious exhibits that used to be possessions of the former Laos Royal family. 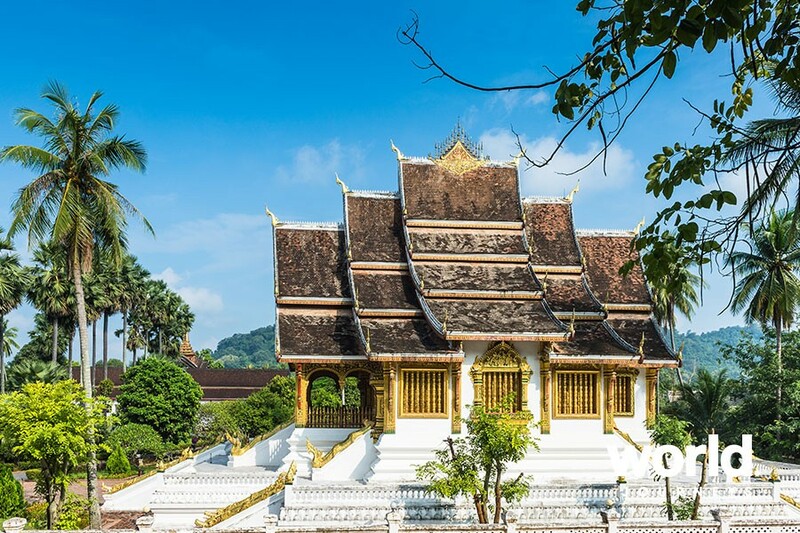 Continue with the exploration of the main Buddhist temples of Luang Prabang including; Wat Visoun, a 16th century temple which serves as a small museum for religious artifacts; Wat That Luang (monastery of the big stupas). Interestingly, the ashes of King Sisavang Vong and his brother are interred inside the large stupa, which was erected in 1910. A smaller stupa in front dates back to 1820; Wat Xiengthong, a 16th century temple which epitomizes all the elegance and grace of Luang Prabang architecture. 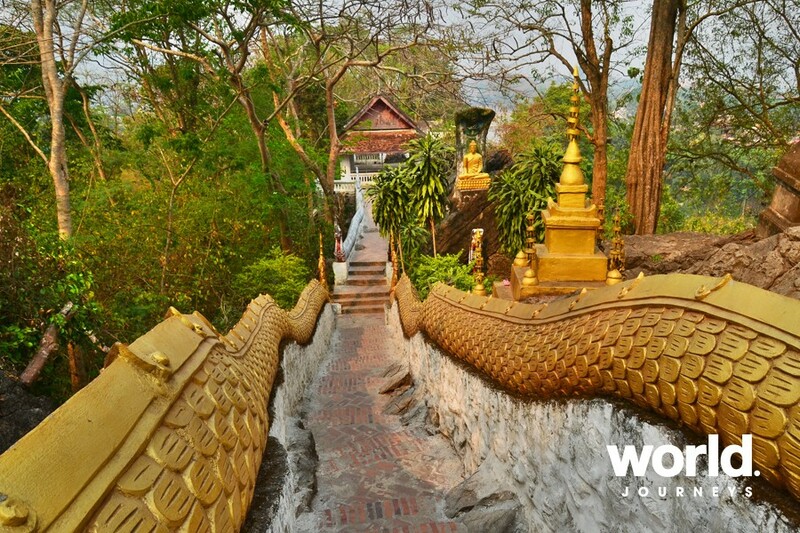 Take the opportunity to interact with the monks at the Wat Mai temple before ending the day with a climb of 328 steps to the top of Phousi Hill. 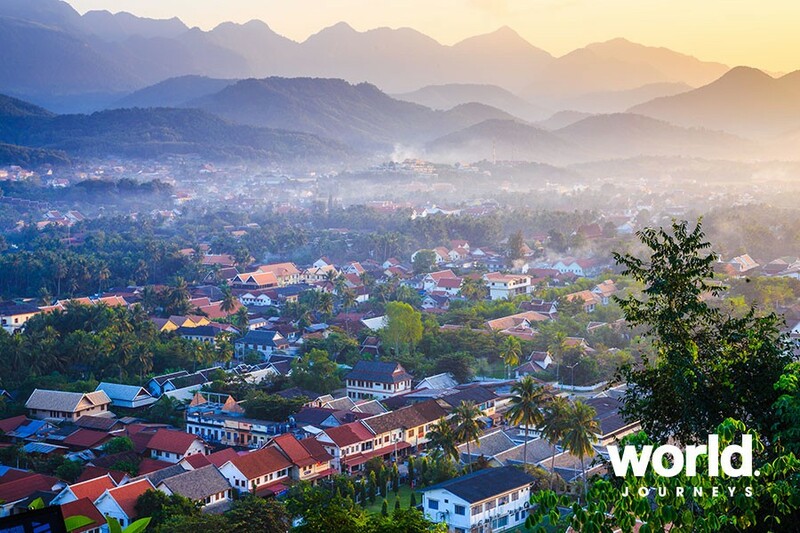 Here you can watch the sunset over Luang Prabang town and the two rivers and forested hills which form its natural borders. Day 3: Luang Prabang > Pak Ou > Luang Prabang (B) After breakfast, embark on a two hour cruise in a long-tail boat on the Mekong River and visit the mysterious Pak Ou Caves. En route, typical Laotian villages are barely visible behind thick foliage. Wooden canoes bobbing by the shore attached to bamboo poles can be seen everywhere while floats mark the location of nets and fish traps. Arrive at Pak Ou and explore the sanctuaries which consist of two large caves. Both repositories house thousands of Buddha images, which range from mere centimetres to two meters in height. Continue to Ban Muang Keo village and observe local weavers and whisky distillers honouring their timeworn traditional crafts before returning to Luang Prabang by car or by the same cruise. Lunch at local restaurant. Day 4: Luang Prabang > Vientiane (B) After breakfast, transfer to Ock Pop Tock, a well known textile gallery and weaving centre based in Luang Prabang. The Half Day Weaving Class is an introduction to weaving on a loom. Each student is assigned a loom and has a guide and a weaver to help them learn the art of weaving. Students will select two colours and will create a placemat-sized woven piece with a Lao motif which can be taken home as a souvenir. Afterwards, transfer to the airport for your flight to Vientiane. On arrival, welcome at the airport and transfer to hotel. (The regular check-in time for all hotels is 2.00 pm. Early check-in is not included). The remainder of the day is free to spend at leisure. Day 5: Vientiane (B) Enjoy a visit to all essential landmarks the small and charismatic city of Vientiane has to offer. A world apart from other frantic Asian capitals, Vientiane remains a quiet and pleasant town. Start at Wat Sisaket, which is the only temple left intact after the Siamese invasion of 1828. See thousands of Buddha statues lined up before visiting Wat Phra Keo, which is a religious museum that displays a collection of art representing Lao and Khmer artifacts. Continue with a visit to the most popular Wat in town, Wat Si Muang before visiting Patouxay monument, Laos' version of the Arc de Triomphe. End the day at That Luang, regarded to as the holiest site in Laos. This gold-like building was constructed in the 16th century. Day 6: Depart Vientiane (B) Free time at leisure until your transfer to the airport for your departure flight. (The regular check-out time for all hotels is 12.00 pm. Late check-out is not included). Day 1: Arrive Vientiane Upon arrival you will be met by your English speaking guide and transferred by private car to your hotel. (The regular check-in time for all hotels is 2.00 pm. Early check-in is not included). Day 2: Vientiane (B,L) Enjoy a visit to all essential landmarks the small and charismatic city of Vientiane has to offer. A world apart from other frantic Asian capitals, Vientiane remains a quiet and pleasant town. Start at Wat Sisaket, which is the only temple left intact after the Siamese invasion of 1828. See thousands of Buddha statues lined up before visiting Wat Phra Keo, which is a religious museum that displays a collection of art representing Lao and Khmer artifacts. Continue with a visit to the most popular Wat in town, Wat Si Muang before visiting Patouxay monument, Laos' version of the Arc de Triomphe. End the day at That Luang, regarded to as the holiest site in Laos. This gold-like building was constructed in the 16th century. Lunch at Mak Phet restaurant. Day 3: Vientiane > Luang Prabang (B) Your guide will meet you at your hotel to assist you with your transfer to the airport for your flight to Luang Prabang. Upon arrival you will be met by your English speaking guide and transferred by private car to your hotel. (The regular check-in time for all hotels is 2.00 pm. Early check-in is not included). Start a relaxing hike around the ancient town of Luang Prabang. An orientation tour around this picturesque town will give you the opportunity to chat with monks at a local temple. Baci ceremonies are an integral part of Lao culture. Held to celebrate a special event, marriage, a homecoming, or a departure, it is based on an ancient belief that the human being is a union of 32 organs and the "kwan" (or soul) watches over each of them. The Baci ceremony re-aligns the kwan and the body. A village elder will wrap a white cotton thread around your wrist while chanting an invocation to strengthen the power of the blessing. In Laos, white is the colour of peace, good fortune and warmth. Enjoy the authentic experience in a unique setting and feel refreshed and enlightened by taking part in this ancient practice. (Approx. 1 hour). Day 4: Luang Prabang (B,D) You have the option to wake up before dawn to witness and participate in offering alms to hundreds of saffron-robed monks - an awe-inspiring sight. 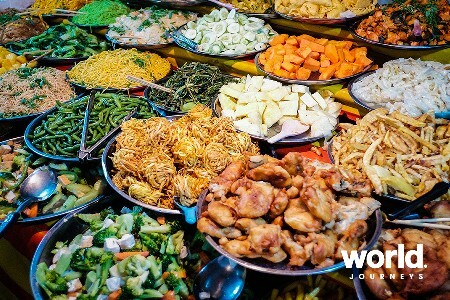 Please tell your guide a day in advance if you wish to make an offering so he/she can prepare some food for you to hand over to the monks. This early morning ritual dates back generations in Laos. Watch the town come to life in the morning then return to the hotel for breakfast. (If you do not wish to make an offering, please keep an appropriate distance and observe the ritual in silence. Dress appropriately - shoulders, chest and legs should be covered). Day 5: Luang Prabang > Pak Ou > Luang Prabang (B) After breakfast, embark on a two hour cruise in a long-tail boat on the Mekong River and visit the mysterious Pak Ou Caves. En route, typical Laotian villages are barely visible behind thick foliage. Wooden canoes bobbing by the shore attached to bamboo poles can be seen everywhere while floats mark the location of nets and fish traps. Arrive at Pak Ou and explore the sanctuaries which consist of two large caves. Both repositories house thousands of Buddha images, which range from mere centimetres to two meters in height. Continue to Ban Muang Keo village and observe local weavers and whisky distillers honouring their timeworn traditional crafts before returning to Luang Prabang by car or by the same cruise. The Ock Pop Tok Living Crafts Centre is a well-documented gallery where weaving and dyeing techniques of silk are showcased to curious visitors. Learn more about silkworms and receive a brief introduction to the natural dyes. You will partake in a hands-on activity and prepare two dye sources yourself after which you dye white scarves in your chosen colours. Meet with the local weavers, who will give you an introduction to traditional weaving techniques. End your visit with a stroll around the garden and enjoy a cocktail with Lao canapés before returning to your hotel. 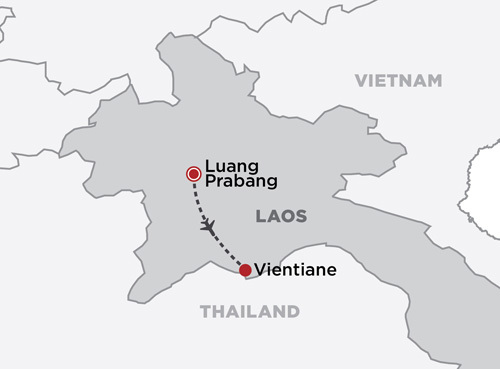 Day 6: Depart Luang Prabang (B) Free time at leisure until your transfer to the airport for your departure flight. (The regular check-out time for all hotels is 12.00 pm. Late check-out is not included). • Surcharge applies during Pi Mao Lao, the Laos New Year 13 - 15 Apr and peak periods. Enquire for details. Mai Lao, the Laos New Year. In Laos, many shops & businesses are closed during this period or may operate on a limited schedule although most restaurants remain open. As it is a tradition to splash water on each other to bring good luck during this period, travellers should take care of their phones, cameras & laptops. Additionally, travel times might need to be adjusted during this period as some festivals are held in the streets and cause small delays.